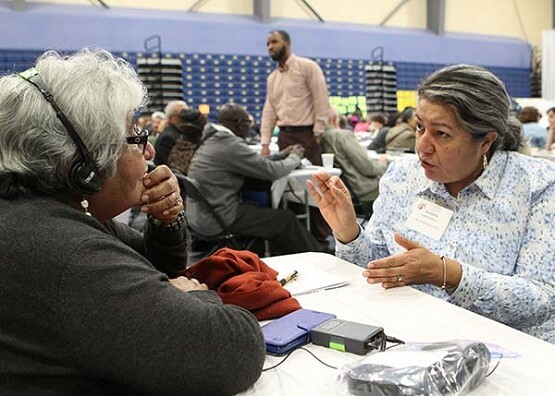 Helendora Flores of the Street Vendor Project in New York City listens Feb. 17 to Socorro Lagarda-Quiroz, a leader in Communities Organized for Relations Power in Action, or COPA, based in Monterrey, California. Proud Ground, a Portland nonprofit that helps low- and moderate-income Portlanders afford houses, was invited to attend this winter’s Vatican-inspired U.S. regional World Meeting of Popular Movements in Modesto, California. Briauna McKizzie and Yesika Arévalo attended the four-day gathering of more than 600 representatives of grass-roots organizations. Like many organizations represented in Modesto, Proud Ground has received grants from the Catholic Campaign for Human Development. Pope Francis congratulated the group for responding with mercy to society’s hurting people. Cardinal Peter Turkson, prefect of the Vatican’s Dicastery for Promoting Integral Human Development, read the pope’s message. The letter encouraged wide-scale community organizing because it achieves social justice. Workers like McKizzie and Arévalo left Modesto feeling supported in their initiatives. Some even felt evangelized. David Gray, 44, a staff member of Accompanying Returning Citizens with Hope Ministry of the Society of St. Vincent de Paul in the Diocese of Columbus, Ohio, was among those whose said his views expanded during the meeting. Describing himself as socially conservative, Gray said he was impressed by the stories he heard from people living in society’s shadows because of their immigration status and why they turned to groups involved in faith-based organizing. “I’m looking at that in a new way to see the humanity of the whole issue instead of just the data of so many people coming across the border,” Gray said. Kim Dunn, a leader with Together Baton Rouge in Louisiana, left Modesto with newfound hope that people will work together to diminish fear of economic uncertainty, end racism and welcome immigrants. The push for sanctuary for immigrants was on a lot of minds.